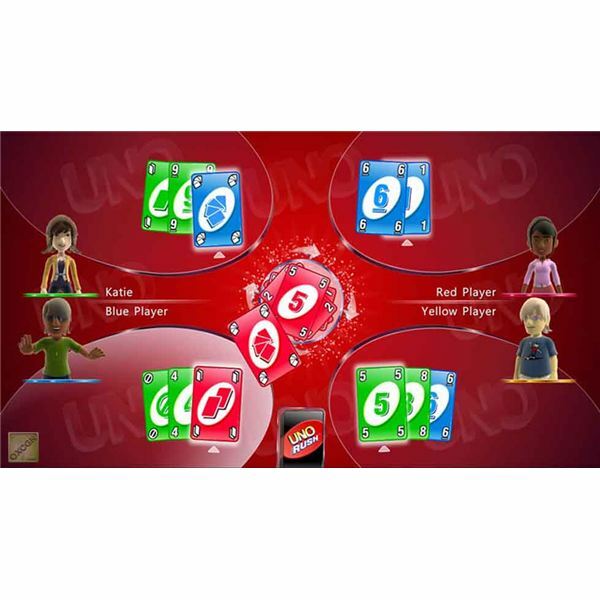 Uno Rush has been around for a while but recently Xbox Live Marketplace had it on sale and a new group of people have discovered the game. 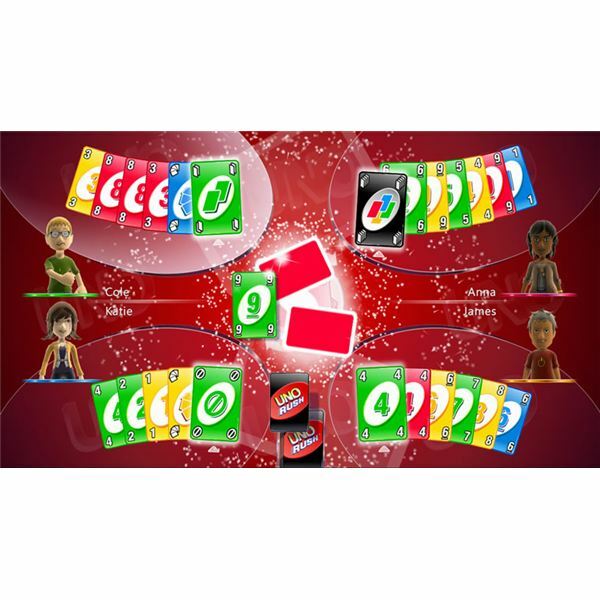 It is similar to regular Uno where players try to get rid of all their cards before their opponents by matching colors or numbers and using command cards to win. 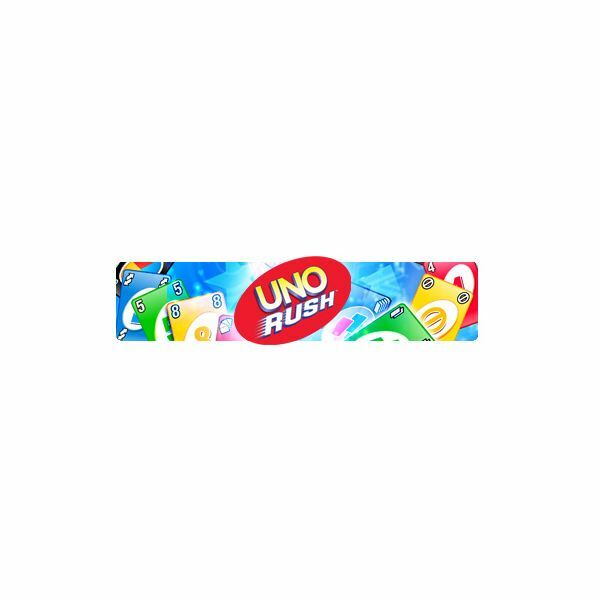 However Uno Rush is different in that all players’ cards are face up for the entire group to see and you have seconds to play at least one card or your turn is over. So how can you learn to play in a game where the next player can know what card to throw? Here’s how to learn to play Uno Rush. Uno Rush has three speed settings in the game: slow, normal, and fast. Start by playing all games on slow. There are three game modes: standard, partner, and elimination. Standard is the default setting. There is a tutorial for Uno Rush but it does not really “show” you how to play. Using the tutorial and actually playing against an opponent, real or AI, are two different things. 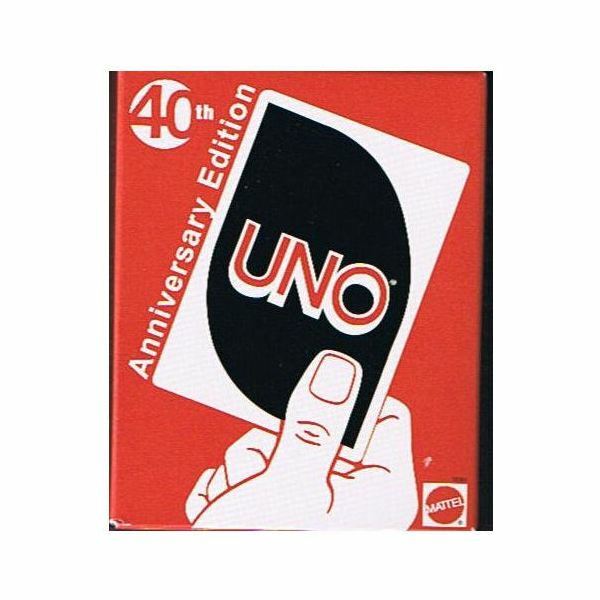 Uno Rush’s standard game is 7 cards, normal speed, must call Uno, command cards and wilds as normal, and the game to 250 points. All these can be changed once you are comfortable with the game. Slow speed will give you time to move your cards into the order you want. 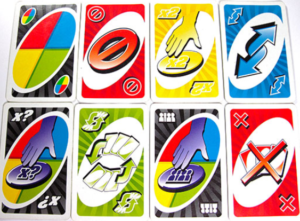 Since you can play more than one card in Uno Rush during your turn it is wise to put all colors together and if you have any cards with the same number but in different colors, put those next to each other as well. This way when your turn comes you can play all the cards possible to give you a better chance to go out first. For example your starting cards consist of a red nine, yellow nine, red three, and a blue draw two while the discard pile has a red two. Put the red three first, then the red nine, and finally the yellow nine. When your turn comes Uno Rush will play the first three cards, leaving you with the blue draw two. Those three cards playing all at once are where the “rush” in Uno Rush comes from. 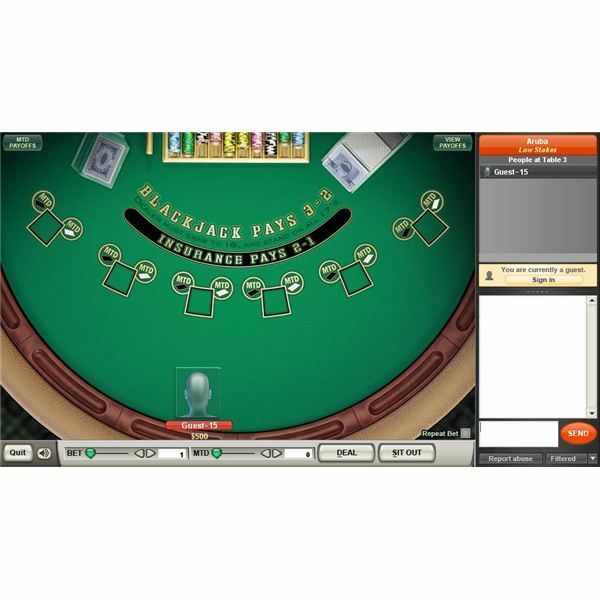 You have to also remember to call Uno as you are playing your second to last card by hitting the “X” button. If you aren’t fast enough, your opponents can challenge you, by hitting the “Y” button, and you get two more cards. Of course you can attempt to challenge them when they get to the same point. Uno Rush will keep you on your toes because one person can change the game with one card. Instead of being able to play the red nine you had, if the person before you changes it to blue with the two in their hand (with the discard pile showing the red two) you have to shuffle your blue draw two up to the front before your turn ends without you playing a card. When you get more cards and at higher speeds this can be more challenging. It is a good idea to watch your opponents shuffle their own cards, when you can, to see what is coming your way so you can be ready to play the maximum number of cards you can. You can even go out in one turn if your cards are in the right order with the right color on the discard pile. 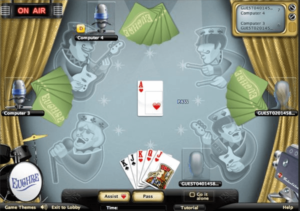 draw two, your turn will end as soon as the draw two is played. Along with the draw two there is skip, reverse, wild, draw four wild, and a newcomer, the shuffle card. The shuffle card is great because it shuffles all the cards of the next player into a random order and they do not get to play. For someone who has their cards in order to go out on that turn, this is frustrating since they now all have to be reshuffled into the correct order, which may not happen before their turn comes around again. 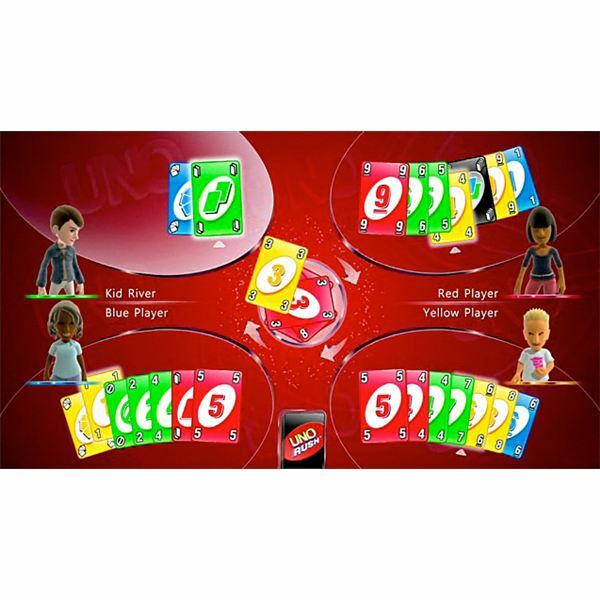 The best way to learn Uno Rush is to play with friends or family, especially those who have never played before. This way everyone is on a level playing field. You all can learn from your mistakes without feeling like someone bested you because you don’t know the game. Move up the speed to normal once you have gotten very good at playing, usually when slow seems to take a very long time.